Help your large blooming flowers grow upright and remain beautiful with these Tom Chambers Cottage Garden Grow-Thru Grids. These five, hardy steel units install with ease into your soil, and their generous size is perfect for larger plants. 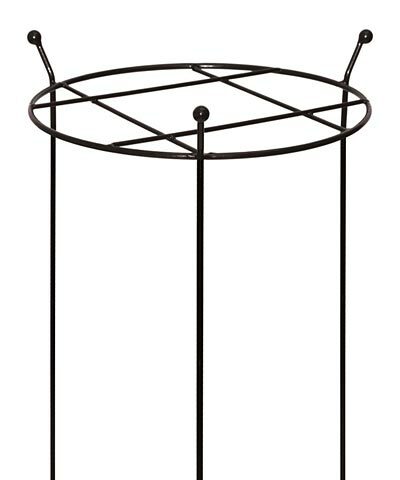 A top, 17.75" diameter ring with an interior grid allows your flower to grow through the item, and creates ample support for tendrils. This helps evenly distribute the weight of the plant, reducing stress on the root system. An orb tops each of the three legs, and their 28.75" height is great for taller plants. The black color of each support adds a classic hint to your landscaping, while the plastic coated steel construction remains durable. Showcase large blooms growing upright with help from these Cottage Garden Grow-Thru Grids. Note: This case pack includes 5 of the Tom Chambers Cottage Garden Grow-Thru Grids, 19" dia.